Wise-Sync has undertaken it's first pricing review since it launched in 2013. With the constant change of the needs of our business, a pricing review was an integral part of the viability of our sync platform for the long term. New pricing is effective for new accounts from the 4th of August, 2018. 2018 certainly shaping up to be quite the year. We’ve passed our 500th customer, synced over 10,000,000 invoices to cloud accounting, onboarded over 140 Wise-Pay merchants who have processed over $65,000,000 in invoice payments. That’s a great result, and continued signs of great things to come. So, why are we talking about changing our pricing? In recent months, we’ve added over 15 staff to Wise-Sync, from Consulting and Support to Product Management and Development and what is apparent is that we can’t sustain the current needs of the business to support all of our customers needs, from onboarding through the entire life cycle of addressing issues arising in third party applications such as ConnectWise; while charging an average of $115 per month. With this in mind, we had two options. 2. Invest in the future, and revise our pricing. We decided for the second option, which requires a significant investment on our part over the next 12 months, together with the need to change the way we charge for Wise-Sync. With our new plans, we're now able to offer a more wholistic approach for use of our platform that recognises the increased costs based on volume and expectations on support where more complex components are used. To put it simply; Wise-Sync reduces manual effort and increases the efficiency of accounting, reducing the manual effort by many hours per month. We recognise that this efficiency is a factor of the value we bring, and as the volumes increase, so too does the efficiency. Our pricing will reflect this, with more focus on the volumes of the transactions processed, together with the complexity of the software needs. A company syncing only (100) invoices and expenses will see a reduction in price. Where a partner syncing (200) invoices, procurement and inventory will see an increase in line with the increased complexity of providing the platform. Records synced will now only count Invoices (and recurring errors). Only Invoices > $0 will count toward your monthly record count. Partners syncing Inventory will require Enhanced Support. Additional Records can be purchased and added to the plan to allow additional records to post where the monthly limit is reached. 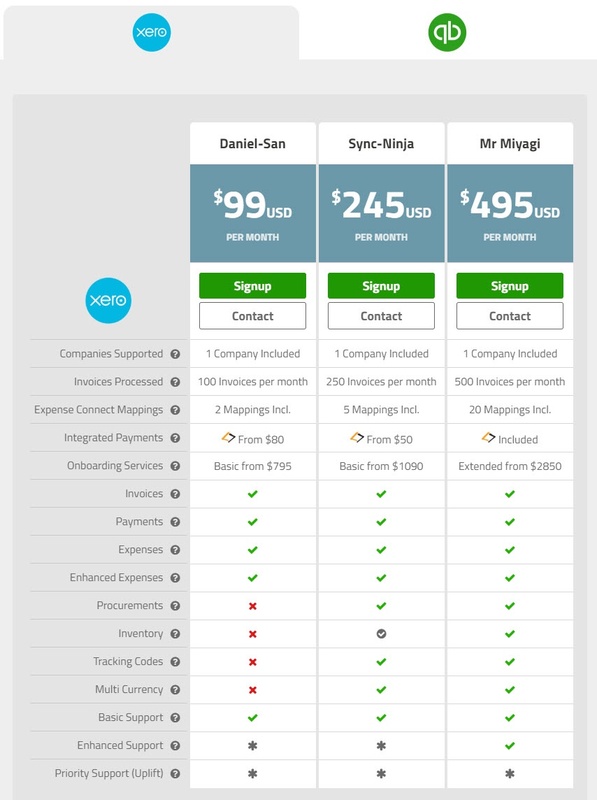 New Plan: Mr Miyagi - For enterprise partners syncing larger numbers of invoices. Priority Support (Uplift), will provide extended support with Product Specialist Escalation and will have SLAs defined. Monthly Consulting Options, providing for a small number of consulting hours per month, for that 'Question' or specialist consultant need. We recognise that any price change is seen as an impact on your business, which is why we have carefully considered the approach to ensure that we are focusing our pricing based on use of the platform, and expected support and application management that comes with these requirements. Our prices have already been updated on our website, and will be in effect for any new partners who sign up after the 4th of August, 2018. Existing partners will be migrated to the new pricing from 1st of November, 2018. For more information on these changes, you can view our pricing update page here.